Hidden under the surface of Barcelona lie many remains of the city’s history. 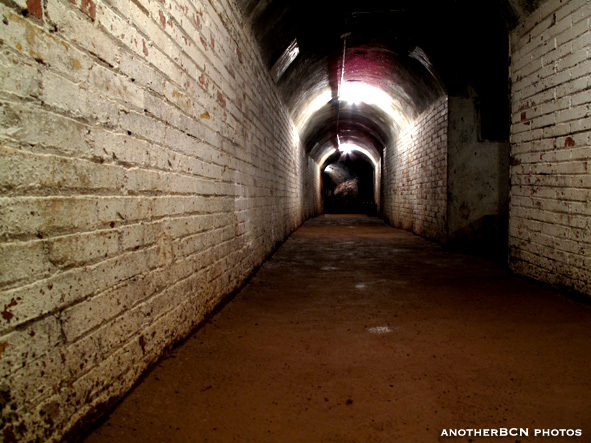 Including about 1,400 bomb shelters built during the Civil War. Because of its strategic position, Barcelona was the target for the attacks made by the Italian Fascist air force, which collaborated with the revolutionary forces that were fighting against the Republic. The city was one of the first places where non-military targets were bombed, attacking the civilian population. Madrid and Gernika were also brutally bombed, but while these two cities were near the front-line fighting, Barcelona formed the rearguard. Prior to the bombings, the city council made the citizens aware of the threat and orders were given to build 30 shelters, which would not be sufficient for even 5% of the population. Everyone laughed at the first shelters because no one could ever imagine that Barcelona would be a victim of air raids. Sirens were also placed all over the city and pamphlets were issued giving instructions about what to do in the event of bomb attacks. On 13 February, 1937, Barcelona underwent the first of the 192 attacks and when everyone realised that there were not enough shelters they began to build many more that were gradually registered. Resources were scare and the strongest people were away fighting on the front, which meant it was mostly elderly people, women and children who were responsible for building the underground tunnels. There are records of about 1,400 shelters, although there could easily be as many as 2,000. Most of these shelters were built using the Catalan vault (volta catalana), an architectural technique used in Catalonia to make arches stronger and wider. In this way, the passage could be wider and throughout its length there was enough room to place benches on both sides, so people could sit down whilst they waited. Usually people had to wait about two hours: the time an attack lasted and also the length of time the battery could supply electricity to the underground area. We need to take into account that during the attacks the city’s electricity was cut off, thus making it difficult for the planes flying overhead to identify their clearly marked targets, because, among other things, the aim was to destroy historical monuments in order to demoralise the citizens, create an atmosphere of bewilderment and open a new front of internal war. Due to the lack of radars at that time (they were discovered for World War II), there were ‘lookouts’ who patrolled out at sea with the mission of observing the sky and if they saw planes, they warned the whole city. From that moment, the citizens had between one and two minutes to reach the shelter before the bombing commenced. The tunnels had several entrances as only one would have acted as a bottleneck, especially when taking into account people only had two minutes to enter inside, and also for prevention, because in the event one door caved in, it would be possible to exit through another. Today it is possible to visit several air raid shelters, including number 307, the Bomb Shelter (Refugi) in the Plaça de la Revolució and the one in the Plaça del Diamant. 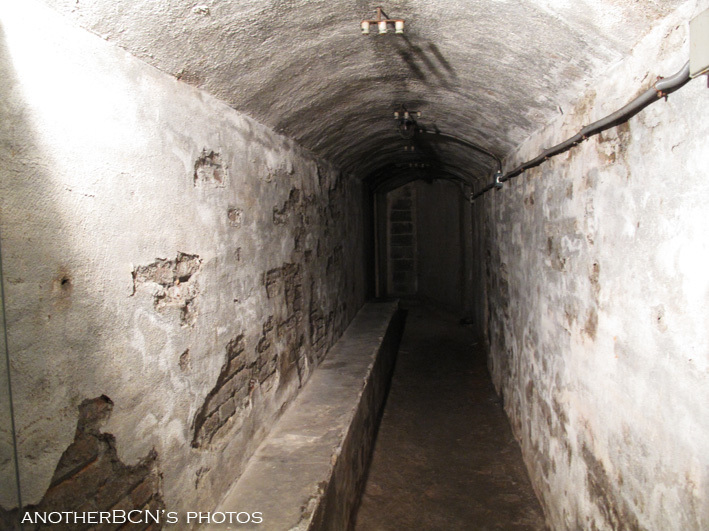 During the Civil War, about 1,400 bomb shelters were built in Barcelona. 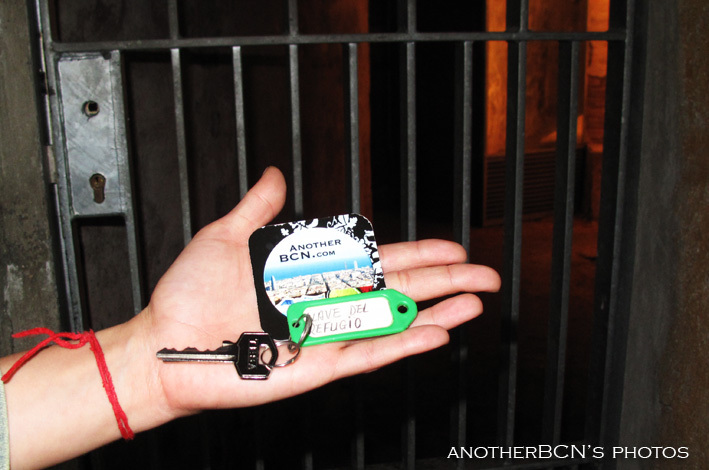 The most well known, and which can be visited today after booking in advance, are the bomb shelter number 307 (refugi 307) in Poble Sec and the one in the Plaça del Diamant, in the district of Gràcia. But there is a third, unknown to most people, located in the Plaça de la Revolució, also in the district of Gràcia. The shelter can be visited free of charge and the most curious thing is that visitors have to go through the underground car park in the square to access it, after asking the cartaker for the keys. It’s really exciting! If you decide to go, make sure they don’t give you the wrong key, which is what happened to us today. Check the key ring says ‘Llave del refugio’ (shelter key). We were really excited about opening the door but after going down four levels (it’s on the bottom floor, 4B) we had to go all the way back up again to get the right key. Once you’ve opened the door, the light switch is on the left. However, there are two rooms in darkness so you’ll have to bring a torch if you want a clearer view of this area. There’s not much left of the bomb shelter: an L-shaped passage with a bench where the refugees used to sit and two small rooms, which might have been the infirmary. On the ceiling it’s still possible to see what’s left of what used to be the shelter’s electricity supply. There was enough electricity to light the room during the air raid, which went on for about two hours, the time the battery lasted. Apparently the shelter used to be longer but whilst they were building the car park, part of it was destroyed. It’s really worth a visit so you can try and listen to the echoes of bygone days. Aah, if only walls could speak! 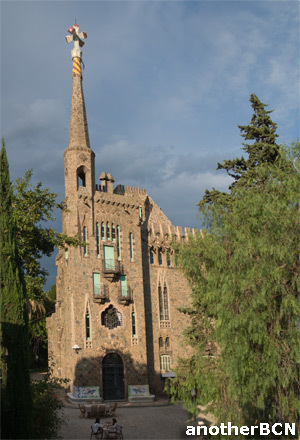 Lying on the mountainside of Collserola, not as well known but just as precious as any other of Gaudi’s works, is the Bellesguard Tower (Beautiful view in Catalan). A magnificent small palace that reminds us of the castle where Martí l’Humà, a Catalan monarch who ruled in the 15th century, used to live during the summer months and which used to stand in the same place. 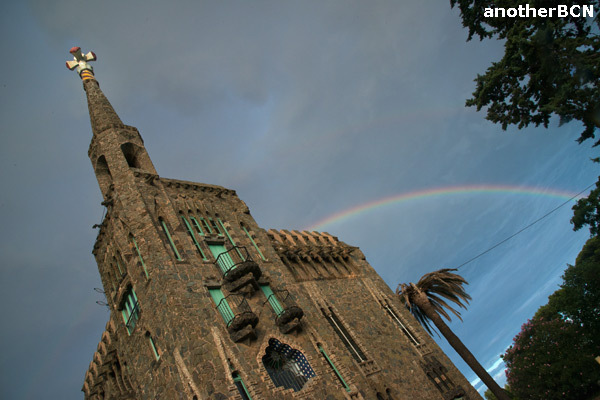 It was not until 1900 when María Sagués Molins, the widow of Jaume Figueras, asked Gaudi to redesign the neglected castle. This is the reason for its official name, Casa Figueras (the House of Figueras), although it is commonly known as the Bellesguard Tower. Today, though it belongs to another family, the house is still private property. However, the garden gates are open to anyone who wants to peep inside. Especially this August, on Tuesdays, there are guided tours around the outside of the house and visitors are treated to a glass of cava and a concert for two violins, whilst on Thursdays, it is possible to enjoy a mojito listening to chill-out music in the background, allowing visitors to calmly contemplate the tower. Visiting hours: Tuesday and Thursday from 18h to 21h (August). From September there will be guided visits every day. I’ve had the chance to visit the place once and I’ve had no doubts about making a second booking, so they can give me a detailed explanation of the house with all its nooks and crannies. As a matter of interest, the day was extra special because the clouds occasionally let the sky through, which lit up the Bellesguard Tower like an apparition. Until the rain suddenly appeared and finally a double rainbow filled the sky, crossing the house. Spectacular. Click here to view more photos of the Bellesguard Tower.